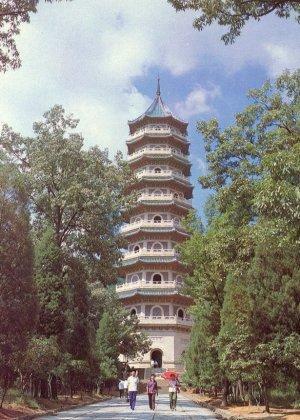 One mile east of the Sun Yatsen Mausoleum stands the Linggu, or Soul Valley Pagoda. The pagoda was originally founded in 514 (Liang dynasty) and later moved to the present site under the orders of emperor Hongwu in 1381. Linggu pagoda was once a sprawling monastic complex where Buddhist monks studied in seclusion. The complex is famous for the Beamless Hall, a 22 meter (72ft) high brick building constructed in 1381 without a single beam or inch of wood.